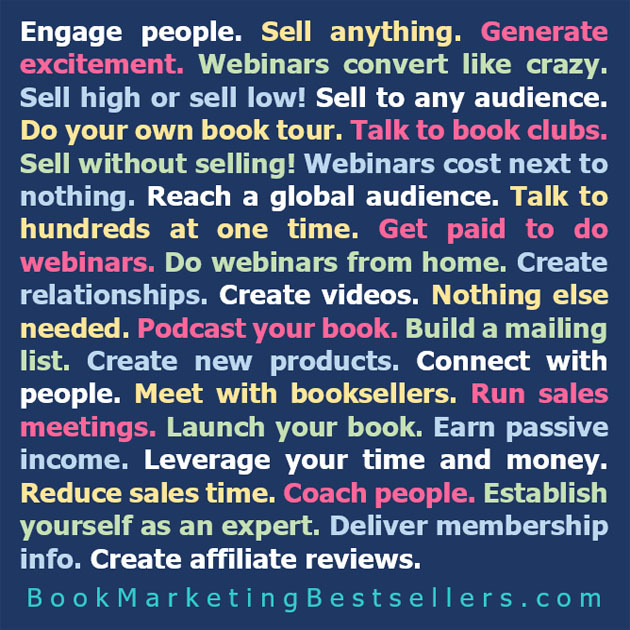 Here are 31 reasons why you should be using webinars to market your books, products, consulting, and other services. Engage people. Webinars are the best form of engagement in the online world. The only thing that can beat them are one-on-one or one-to-many in-person talks. Webinar marketing: Webinars are the best form of engagement in the online world. Sell anything. Webinars are the most effective ways to sell anything online: books, products, services, membership sites, consulting, and coaching. Generate excitement. Webinars are a great way to generate excitement for your crowd fundraising efforts. Better than recorded videos. Better than sales pages. Better than social media posts. And far more effective. Webinars convert like crazy, much better than sales letters, websites, video launches, or social media ads. Once you get good at hosting webinars, you can easily convert 10% or more of the attendees. Webinars convert like crazy, much better than sales letters, video launches, or social media ads. Sell high or sell low! Webinars are very effective at selling high-priced products and services, from $297 all the way up to $5,000 or $10,000 a pop! But they’re also good for selling $10 or $20 books, audios, and videos. Sell to any audience. Webinars work in any market, not just for Internet marketing, but also for crafting, cooking, sports, how-to instruction, history, psychology, relationships, self-help, and more. They can even be effective for authors selling memoirs, novels, short stories, and poems. Do your own book tour via webinars. You can use webinars to give people a chance to meet you live. Or give readers a chance to ask questions of you. Fiction readers love interacting with real authors. And poetry can only really be sold by people hearing and seeing YOU read your poetry. Do your own book tour via webinars. You can use webinars to give people a chance to meet you live. Talk to book clubs and reading groups via live webinars. Give a presentation. Do Q&A back and forth. Offer to do a live Q&A webinar for anyone choosing your book as their reading selection for any upcoming month. Sell without selling! Webinars allow you to educate and entertain your potential customers before they buy from you. 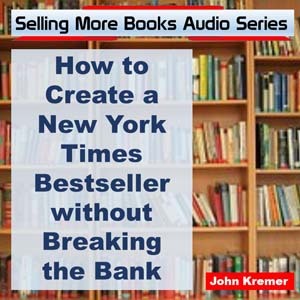 For book authors, this is an easy way to make sales without having to do any selling! Webinars cost next to nothing. You don’t have to set up a website. No hosting is required. Just a minimal webinar service subscription. Check out the new webinar hosting solution from Get Response. Webinars cost next to nothing. Check out Webinar JEO’s low-cost option. Reach a global audience. The new technology makes it so easy and cheap to run global webinars to reach 10 people or 10,000 people. On camera or off! Do webinars from home. Or from anywhere you’re traveling via your laptop (and, soon, from your iPad). No traveling. No bad airline food. No TSA agents feeling you up and down. No hotels. No room rentals for seminars. Create relationships. One of the best ways to create a relationship with influential people in your field (a great novelist, a famous author, a popular social media person, a top blogger, etc.) is to interview them in a live webinar. Once you’ve interviewed someone, you’ve started the beginning of a beautiful friendship. Once you’ve interviewed someone, you’ve started the beginning of a beautiful friendship. Talk to hundreds at one time. Once you start doing webinars, you’ll soon build up an audience of people looking forward to each new webinar. You’ll be able to talk to hundreds of prospects in one session. Create videos. Webinars are the easiest way to create new videos you can upload to YouTube, Facebook, and more. And everyone will tell you that videos are better than anything else at getting the word out about your new book! And the give-and-take of webinars are far more effective than book trailers at getting readers interested in your book. Get paid to do webinars. Besides using webinars to sell other things, you can also have people subscribe to a series of webinars. They’ll pay you to do the webinars! Webinars are far more effective than book trailers at getting readers interested in your book. Nothing else needed. You don’t need a website. You don’t need a mailing list. You don’t even need a product. You don’t even have to finish your book. Build your audience by doing webinars! Podcast your book. You can also use webinars to build your audience by releasing video segments of you reading your book. Once you’ve done a webinar reading your book, you can easily convert it to video and audio formats for vodcasting and podcasting. Build a mailing list. Free webinars are one of the quickest and most effective ways to build a mailing list. When people sign up for the webinar, they give you their email address and permission to let them know more about you, your book, and your services. Free webinars are one of the quickest and most effective ways to build a mailing list. Create new products. Webinars are one of the easiest ways to create new products you can sell to prospects before or after you write your book. Connect with people. Webinars are a great way for you to connect with your readers, your fan clubs, your online tribe, your Twitter followers, your Facebook fans, etc. Meet with booksellers. 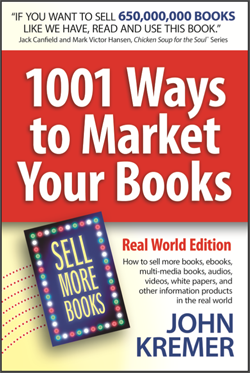 Use a webinar to present new books, new authors, or new sales promotions to booksellers. Use a webinar to present new books, new authors, or new sales promotions to booksellers. Run sales meetings. 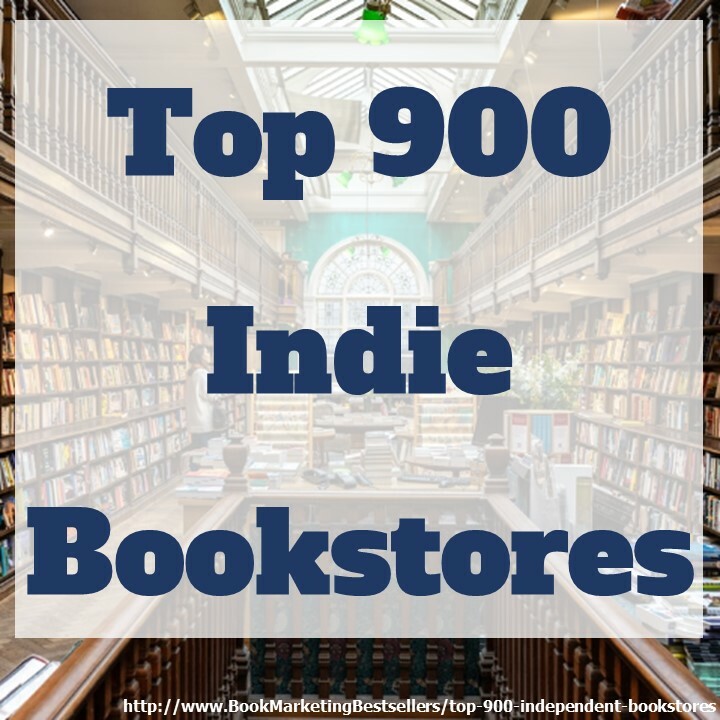 You can also meet with your sales reps, wholesalers, distributors, and other agents to present your new catalog, new books, new authors, and new sales promotions. Earn passive income. Once you’ve recorded a webinar, you can continue to sell the content from that webinar over and over again using an evergreen webinar system. 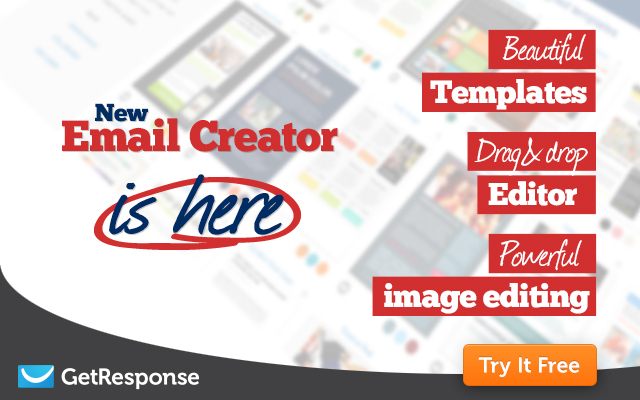 Check out the new webinar hosting solution from Get Response — integrated with their great email creation and mailing program. Launch your book. You can use a webinar to launch your book, product, or service. Webinars are far more engaging and effective than sales pages, blog posts, or social media sharing. Webinars are far more engaging and effective than sales pages, blog posts, or social media sharing. Leverage your time and money. Instead of doing a lot of travel, calling prospects one at a time, or trying to promote to one group at a time, you can leverage your time and money by doing webinars to reach a lot of people in a short amount of time without spending a lot of money. Reduce sales time. Webinars allow you to make sales more quickly than many others ways to market. A one-hour webinar can help you make hundreds of sales rather than one or ten. Coach people. You can use webinars to coach your clients one person at a time or via group coaching. Rather than doing phone calls that don’t show anything, use webinars to teach and inspire with charts, videos, graphics, screen shots, and other visual aids. You can use webinars to coach your clients one person at a time or via group coaching. Establish yourself as an expert. Promotional webinars, especially Q&A webinars, are a quick way to establish yourself as someone who knows a lot about your topic. Offer a weekly Q&A session for one month to introduce potential clients or customers to what you know–and know well. Deliver membership info. If you want to create an on-going membership program, webinars are a great way to deliver the content. And to handle the follow-up Q&A sessions (if required). Create affiliate reviews to sell other people’s products and services. Video reviews are one of the best ways to sell others on a service or product or book you like. Video reviews are one of the best ways to sell others on a service or product or book you like. Check out the new webinar hosting solution from Get Response — integrated with their great email creation and mailing program. Click Here!